The magazine photo of zebras was too much to resist. I colored them with watercolor markers. 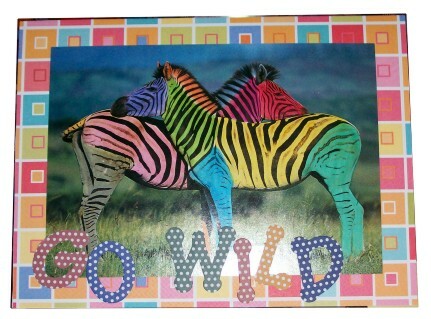 Since I had the stripes I used squares for the background with colorful scrapbook paper. The lettering is diecut paper letters (they came in little stacks) and the dots and multiple colors made the package come together. 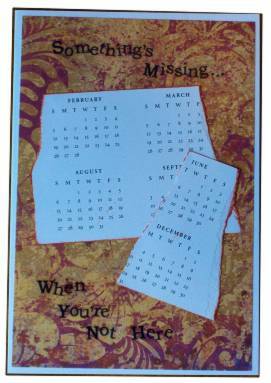 Torncalendar pages, with inked edges, are the centerpiece of this 'missing you' card. The choice of paper for the backgrounds lends a feeling of nostalgia. Lettering is individual clear letter stickers. 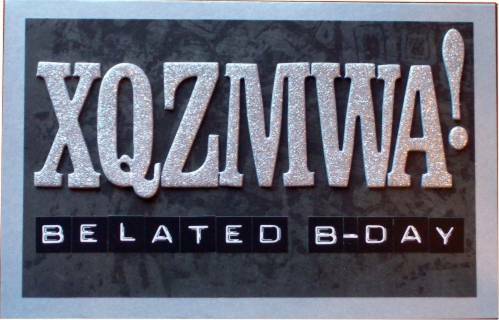 Ever since I saw this letter combination on a license plate I have thought it appropriate for belated birthday greetings. It is a great way to use up the strange letters in your sets, too. 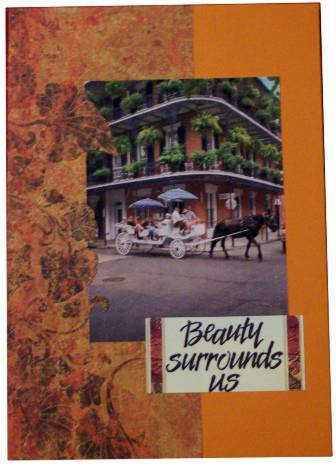 For this card I want the appology to be overstated, so I used large glittered chipboard letters. The birthday greeting is a sticker set. Black-on-black scrapbook paper and silver cardstock extend the feeling of class without looking too matchy-matchy. I'm sure the craft teacher on my cruise had no idea she was feeding right into my A to Z challenge, but everything fit nicely into my pre-selected themes. For this card we tore the edges of a piece of colored cardstock, added a cut shape of blue followed by a starfish cut of sandpaper. We used wire, twisted it around a pencil, and threaded on beads before poking the wires to the back and taping them down. We folded a card and tore the edges and mounted the prepared pieces to the face of it. 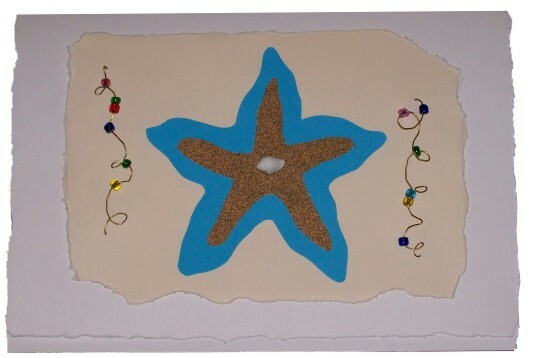 The finishing touch was a seashell glued to the center of the starfish. I got these values from paint strips! On top of floral scrpabook paper I mounted a branch cut from a strip in brown tones. Sharpie marker was used to draw in bark. A bird from a calendar illustration found a home on the branch to which I added leaves cut from a green paint strip. Sharpie was used for the leaf veins. 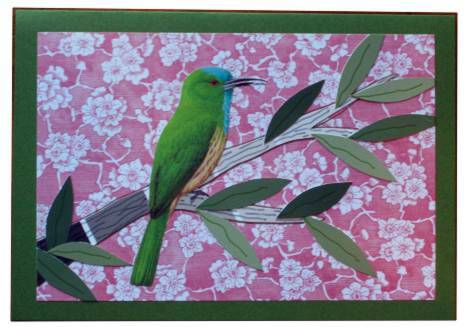 Base card is green cardstock selected to match the green leaves and the bird. Back to crafts from the cruise. I actually followed the directions to the letter on this one and came away with a beautiful stretchy bracelet of seashells and faux pearls. 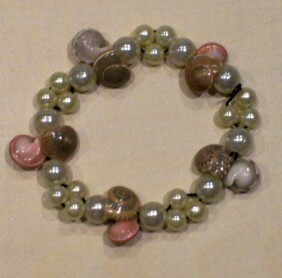 If I were to do this again I would use a cord of taupe or even clear, but we used waht we were given which was black. 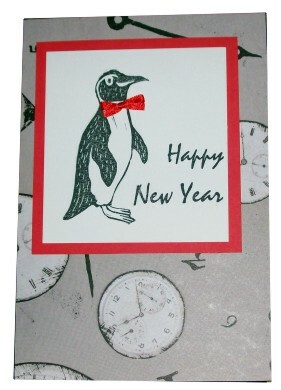 Once I added a ribbon bowtie to this little penguin (one of my handcarved stamps) he was suddenly ready for a party. I found scrapbook paper with clocks all over and knew it was New Year's Eve! All I had to do was frame him out in red and stamp the greeting. These too-cute pictures of my grand-daughters were perfect to be framed by pastel slide mounts. The organza ribbon is also snapped into the frame behind each photo. All mounting (on scrpabook paper over cardstock) is done with silicone glue. Why shouldn't a Grammie be proud of these little beauties? 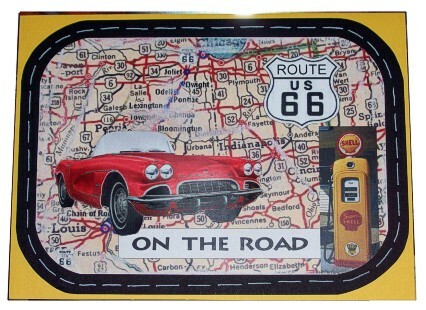 This 3D card centers around one of the icons of American history - Route 66. I printed a map and the gas pump from Google Images and added the caption digitally. After printing I scuffed the map to antique it a bit, added the 3D corvette androunded the corners. I mounted on black cardstock, rounded those corners and gave the border a 'center line' to turn it into a road. Yellow cardstock echoes the gas pump. My hubby says it is too vague a reference but, hey, its my challenge so I do what I want! Did you get it? It's the French Quarter! A scrapbook paper was sliced around it's scrolls to allow the photo of the carriage to tuck under them. A sticker adds the text. Photos must mean vacation! 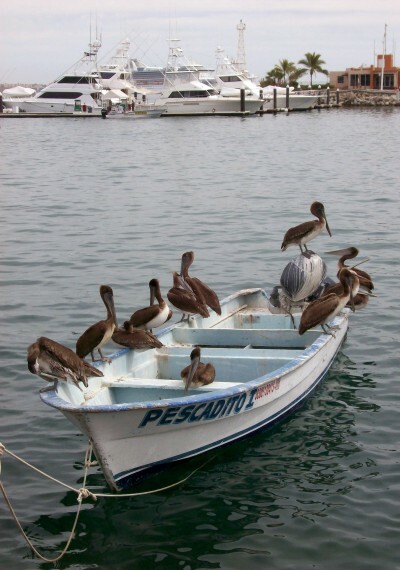 These brown pelicans were snapped in the port of Cabo san Lucas, Mexico. It is just happenstance that the composition of this photo came out as well as it did as I was photographing 'on the run' to keep up with hubby! I tried out this origami heart for the first time. I'm pretty sure I mangled the instructions for the center as it is supposed to look like an open flower! I mounted it on sparkly gold mylar to play up the gold in the paper and then nestled it in a bed of roses (scrapbook paper). The text is a sticker. I used my needle to stitch up this embroidery card using a new stencil from Crealies. 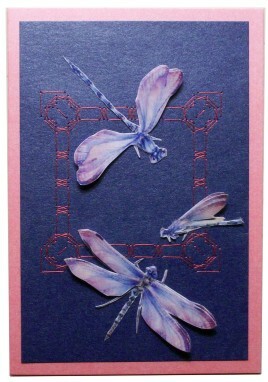 I added 3D dragonflies. This magnet is made using reverse painting on the back of a fla-back glass marble. Acrylic paints were used to paint first the white center, then the brown throats, then the yellow petals, the brown stripes, and finally the dark yellow petals. After the paint is dry clear glue is used to coat the back and adhere to a circle of white craft foam and that to a disk magnet. This was one of the crafts offered on my recent cruise although the project was really supposed to be a big yellow sunflower. I don't follow directions very well! LOL! 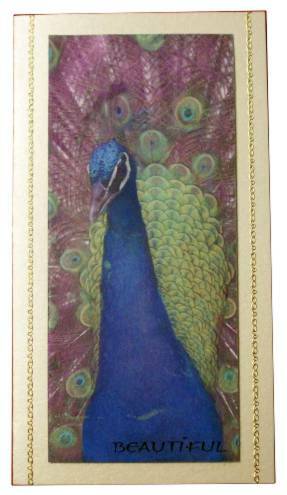 I love the luminescence of peacock feathers.I started with a photograph of the peacock and added adhesive to the face of it with my Xyron. Then I used my fingertip and tapped Pearl-Ex powders in interference green (eyes of the feathers), interference blue (body and head) and interference violet (main tail). After covering this way I burnished in the color to take up all the tackiness of the adhesive. Finally, I used a cloth and rubbed away all the excess powder. I mounted with foam tape for dimension on an irridescent cardstock and added a clear text sticker and borders of gold peel-off. 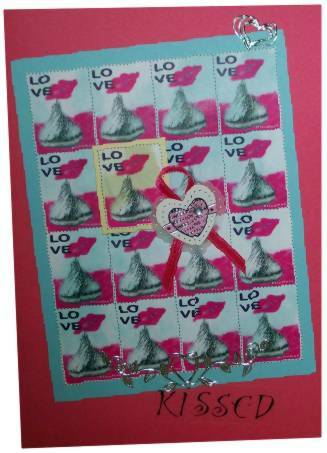 I created the stamp sheet digitally with a photo of a Hershey's Kiss and CorelDraw. I printed several copies and used faint stamp pads to lightly color the backgrounds. The blue tinted sheet is mounted first with a blue border. Then a single stamp of the green tinted is bordered in green and mounted with foam tape for dimension. The beribboned heart is a 3D sticker. 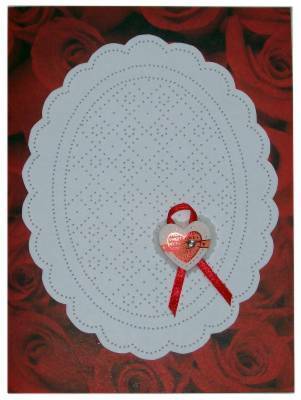 Peel-off silver hearts are added top and bottom and the card is finished with a clear text sticker. OK, you may not immediately see the connection, but this is a salute to the Boy Scouts of America! It's not exactly a jamboree-ish illustration but the BSA is famous for it's jamborees. So there you are! 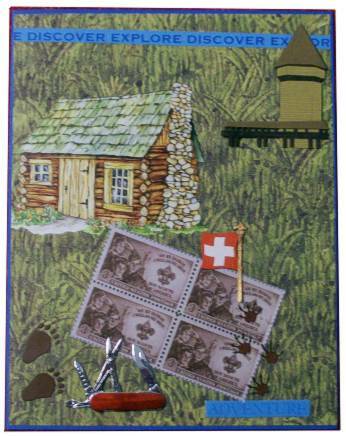 I used 'grassy' scrapbook paper for a background, added rubons (cabin, animal tracks), 3D stickers (tower, flag, knife), digital illustration (stamps), and scrapbook paper (text strips). Hmmm, what is it about the letter I that makes me turn to digital imagery? LOL! I know a couple who are quite fond of all things Celtic aso I wanted to do something along that line for them. I looked up images of the Claddagh and then found photos that I could edit and combine to recreate it. I used PhotoPaint for this. 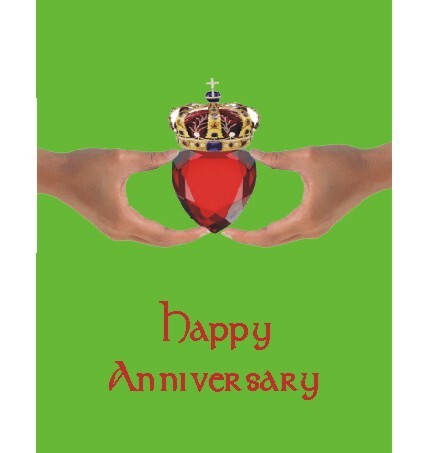 Then I brought the whole graphic over into CorelDraw to give it a background (Kelly Green) and a greeting in an Irish font (red to go with the crystal heart). This was printed directly onto cardstock and folded. My husband voted this 'one of the top 10' cards I've ever made! The paper pricking pattern is from the book 'The Art of Decorative Paper Pricking' by Janet Wilson. I trimmed around the pierced cardstock and mounted on rose imprinted scrapbook paper. 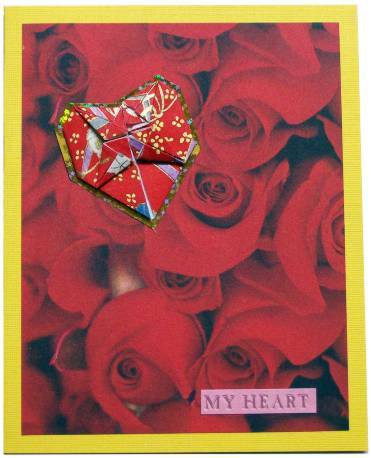 The heart and ribbon is a pre-made element. 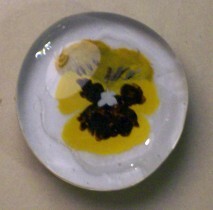 The cruise ship had a ceramics studio where we could go to paint objects and have them fired for us. 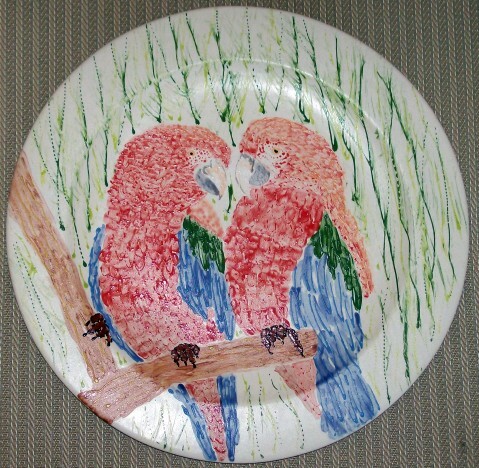 Since we had visited parrots in Puerto Vallarta and had our pictures taken with them I decided to recreate thim on this giant plate. It is a 13 inch diameter platter.